I’m hitting the beach tomorrow! I’m off to a weekend getaway with my friends at none other than our sunny Boracay. Of course, when in the beach, it’s time to tuck away those heels and bring out our trusty Havies a.k.a. Havaianas! I’ve always been biased over Havaianas’ slim straps because I believe they look better on a woman’s feet. 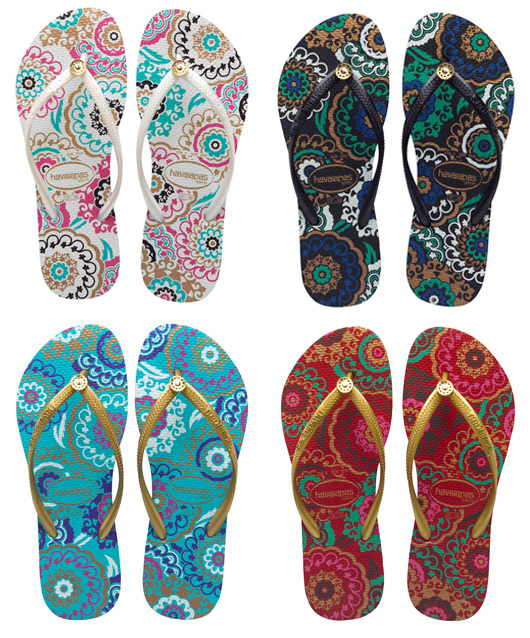 So when Havaianas released their Slim Turkish line (as seen above), I fell completely in love with those babies! Don’t you just love the patterns? I still can’t decide which among the white, black, ocean green and red is my favorite. They’re all so loveable and pretty! How about you? Which one is your favorite? For more about Havaianas and their collection, visit www.havaianas.com. Havaianas is available at All Flipflops, Celio, Duty Free Philippines Fiesta Mall, Gas, J&S Surf Shop, KidSports, Manila Polo Club, Manila Yacht Club, Moana, Nail Spa, ROX, Rustan’s, Stoked, Tick Tock Flip Flop NAIA Terminal 3 and Urban Athletics.